Because I apparently don’t have enough to sew for myself (ha! ), I like to join swaps. I like the fun and challenge of sewing for someone else every now and again. I love that it’s a way for me to break from my project monogamy without committing to another full blown project, at least until it’s my month. And even then, the blocks are done. I can let them percolate until I’m ready to assemble a top and get to quilting. For most of the last year, I’ve been participating in the Scrappy? Sew Bee It! Swap. This one has been a lot of fun. The vast majority of my fellow swappers are on different continents from me. Getting to see their work is enlightening and inspiring. 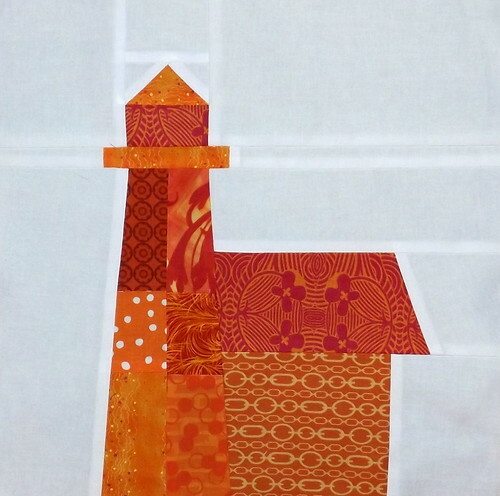 For the month of March, Debra asked for water-themed blocks, like boats, lighthouses and bridges. After browsing the internet, and Debra’s inspiration photos, I decided to draw up my own blocks for Debra. This boat block is a spin off several traditional blocks. I decided to give the sails some masts and made the boat itself a little bigger. 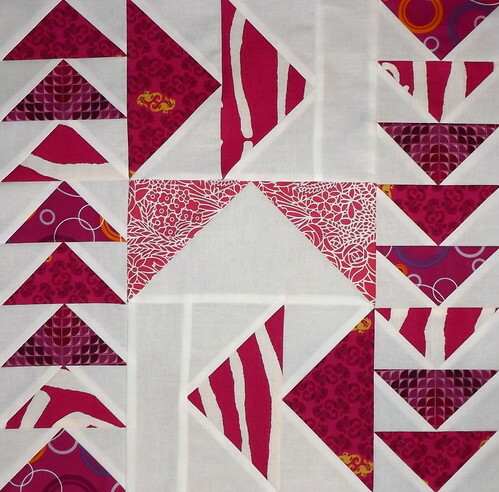 Still, it was a nice and easy block to put together, with basic shapes throughout. Everything but the white was pulled out of my scraps. Coming up with the lighthouse was a little more difficult. This is actually a riff off of a machine embroidery image I saw online. With the exception of the two prints making the house attached to the lighthouse, all of the oranges came from my scrap bin. The second swap that I joined this month is the Granny Block Bee. Yes, I finally drank the Granny Block Kool-Aid. It’s my own darn fault for cutting my scraps down. I now have tons of 2.5″ squares that are just begging to have something done with them. Thus, Granny Blocks. The Granny Block Bee uses the tutorial posted at Blue Elephant Stitches, and there are two queens a month, which means four blocks a month for this bee. I started late, so there was February and March to make for. Each queen makes specific requests regarding their desired colors, though we’re all using Kona White as the background fabric to provide some uniformity. I’m very pleased with how quickly these go together, and I might start piecing some for myself in between blocks for other projects. Yes, I’ll be receiving some when it’s my month, but I think I’d like to end up with a couple of lap-sized quilts when all is said and done. 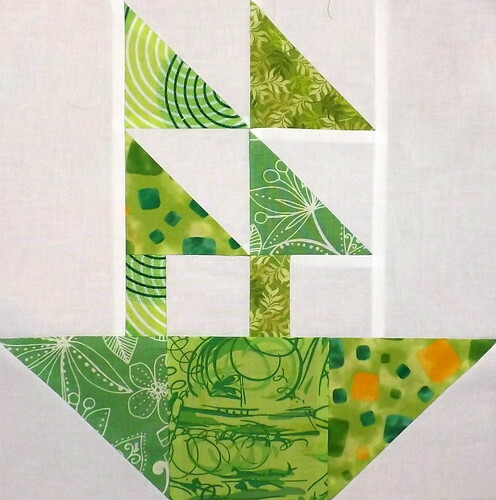 My mother-in-law is moving to a new apartment at the beginning of April, and I think it would be neat to finally gift her with a quilt. Also, I have some friends that I’d like to give a quilt to. Apparently self-discipline is a thing in the Grey Cat Quilts household now, because all of the blocks are done and stuffed into envelopes, and arrangements have been made for JohnPaul to ship them out for me. I’m all caught up, which is just crazy. 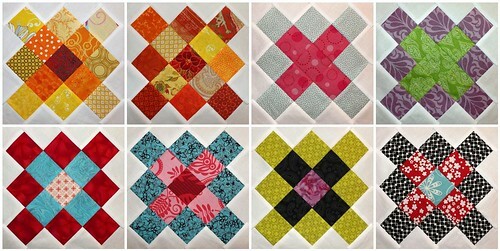 Tags: Blocks, Fat Stash Bee, February, Granny Block Bee, March, Scrappy? Sew Bee It!